From the Book Jacket: When you want to push and shout, hoot and holler, punch or pout, breathe in slowly. Let it out....Say: Peace, baby! Friends grab toys. Siblings don't share. Life's not fair - but we can be! A frustrating day may feel overwhelming, but everyone wins with peace, baby. 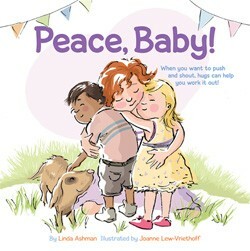 Acclaimed author Linda Ashman's gentle clever rhymes will inspire readers of all ages to find peace within themselves, peace with one another, and peace with the world. Why It's On My Bookshelf: Lately it's been feeling like there are some kids in my school struggling with conflict. When they are frustrated, upset, or mad I'm noticing instead of choosing a peaceful solution they are really hurting the other child's feelings. Towards the end of the school year students can forget kind ways to solve problems. Now seemed like a perfect time to do some re-teaching about keeping your cool. This book has really inspired me to spread the word about PEACE! Peace, Baby! It is so PERFECT for my refresher lessons on conflict resolution. Each page shows a child in the midst of a conflict, then the next page shows them making a caring choice with the words "Peace, Baby!" Kids are now shouting to me from across the playground, "Mrs D! Peace, Baby!!" Excellent!